That was Celia Cruz singing about Tito Puente and the late great Tito Rodriguez (in the English version of La Dicha Mia), but today I’m standing with Tito Puente and his son Tito Puente Jr., all smiles and clowning at a photo shoot. They remind me of Ramon and Louis Puig of Miami’s Casa de la Guayabera’s and Club Space respectively,from last year’s Father’s Day cover. Two guys that genuinely like each other. And also happen to be father and son. Dad’s history is pretty telling. I brushed up before sitting down with him. On April 20, 1923, Tito Puente was born Ernest Anthony Puente, Jr. to Ercilia Ortiz and Ernesto Puente, Sr. in New York City. Tito began dancing in contests with his sister when he was 5 years old. Then throughout the thirties, Tito would perform with local Latin and society bands. He’d rock matinees with Los Happy Boys at the Park Plaza Hotel. By thirteen he was considered a child prodigy in East Harlem’s El Barrio. He met Jose Curbelo when he was 16 and Curbelo immediately hired him to play his orchestra ’s US tour. In the early ‘40’s he played with Machito and Noro Morales, getting drafted into the Navy at 19. By 1945 he was discharged, receiving a Presidential Commendation for being in 9 battles. By ‘47, after studying conducting, orchestration and theory, he graduates from Julliard, which he attended under the GI bill. In ‘48, he formed his first conjunto, the Piccadilly Boys, urged on by promoter Fedrico Pagani, and in ‘49 he recorded Abaniquito on Tico Records. Later that year, he signed with RCA Victor and recorded Ran Kan Kan. From ‘50 to ‘56, he was churning out hits like Babarabatiri and Mambo La Roca and El Rey del Timbal. From ‘56 to ‘60, he released albums like Cuban Carnival, Dance Mania and Puente Goes Jazz. He was also crowned King of Latin Music by Bobby Quintero at the Manhattan Center after beating Perez Prado in a battle of the bands. In 1957 Cuban Artists from around the world were asked to come home to celebrate the 50th anniversary of Cuban music; Tito was the only Puerto Rican artist invited by the Cuban government. The ‘60’s saw the beginning of a series of collaborations with artists like Buddy Morrow and Woody Herman, and two new vocalists just arriving in New York named Celia Cruz and La Lupe. From Carlos Santana to Woody Herman, he’s been covered by the best. From the Cosby Show to Japan, from the Jackie Gleason to the Blue Note he gets props. In ‘94 he performed (a tribute to Dizzy Gillespie, Mario Bauza, and Machito) at the Apollo theater. From the Grammy to the Honorary Doctorates, the world tours and the hype, there is still only one down to earth great jazz timbal player. Tito. And he’s got the Smithsonian Medal to prove it (He’s probably banged out a song on it). As we’re sitting around waiting to take pictures, he’s putting himself to work making up songs on the table and bantering with his son about how to make a hit record. With the soldout concerts in Miami last month and the release of 50 Years of Swing, Tito’s 50th Anniversary Box Set on RMM Records, the hills are alive with the sound of Tito. But then again, they sort of always have been. ñ: What was it like growing up in New York in the 20’s? Tito: My dad worked in a razor blade factory in New York and my mom was a house wife. We were poor, but they always raised us with a sense of honor. ñ: So you started very young, huh? Tito: I’ve always been an artist. Well, you know how it was back in the neighborhood, and they considered me like a prodigy or whatever. And Montesino took me under his wing and had me sit in with him when they’d have neighborhood jams. And well… I took notation of the syncopation and created this instrumentation. ñ: (laughs) Very cool. What was the Palladium era like in New York? Tito: It was a beautiful era. Palladium was like amazing. Back then you had such a great scene, all those clubs were around. Birdland was right down the street, so you had all theses groups picking up moves and chops from each other… it was really a great scene and people from all over the world would come there to listen to what was going on. It’s funny, Latin guys can play jazz but jazz guys can’t always play latin, you know, we’ve got certain riffs or chops and and we can play una clave or un guaganco. ñ: I love the box set. Tito: That record is really great. Put together by Musicologist Joe Gonzo. Some of the stuff I’d almost forgotten I’d done, like Miguelito Vlades or Happy doing Babalú, it’s wild. Of course I have all the old masters so I dug them up and we put it out. ñ: Which one of your records is your favorite? Tito: Favorites are maybe like the Dancemania album, or Cuban Carnival. ñ: What an album that is. Tito: Yeah I was ready for that one. When RCA Victor took me in to record I guess we really laid it down..A lot of the young people think I just recorded that, I tell them it was 30 years ago, and they flip out. That was a record that was definitely ahead of it’s time. ñ: Ran Kan Kan still jams. Tito: It’s 3/4 time and people like to dance to that record. Tito: Oye Como Va… well, people liked to hear a cha cha cha… nice melody and figurations so I love that. ñ: Aside from Tito Jr., do you like when these dance guys sample you? Tito: A lot of these young guys list me as composer so they treat the old guy pretty good. ñ: So who are your favorite singers that you’ve worked with? Tito: Vincentico Valdes, Gilberto Moro, Santos Colon, of the girls they were all so great. The queen Celia Cruz, of course La Lupe, there’s Shopie Hernandez. ñ: So what’s in store? Tito: Maybe play more vibes, you know, ‘cause I like to play the vibes. I gotta get more into that again, people like it a lot, although I might do something more like Dancemania and take care of that stuff; people want to hear a good latin dance record. But maybe I’ll do the vibes record, do a tribute to Cal Jader. ñ: Cal Jader is the man! I have those great records of his on the Fantasy label on red vinyl. Tito: Yeah Cal was a good guy, he took me took me to Concord Records , and I inspired him a lot on timbales and maybe I could in turn just record a tribute to him. ñ: And aside from that, travel and play? Tito: As long as you’ve got the chops..which is important..to still have the chops .. you’ve got to travel around a lot. And it’s fun because there’s a lot of young talent out there. ñ: So what do you think of Tito Jr. being a musician? Tito: I’m honored that he wants to do this as a career, and I think he’s got a good one ahead. He’s getting started and I think he’s growing in the right direction, and so for me it’s a real source of pride. ñ: I was listening to that version of Para Cochero from the 60s. What record was it? On The Bridge I think. Great cover. You’re running across the Brooklyn Bridge with a girl. Tito: That was my wife you know, running on the bridge with me. That was way back. ñ: That was Tito Jr.’s mom? Tito: Yeah that’s his mom. She’s here with me now. Tito Jr. is a character in his own right. As quiet and thoughtful as he is one on one, he’s loud and boisterous and wild when he’s out to party or perform. Always ready to greet you with a shake and a ‘what’s up?’. He’s really making a name for himself in the club-radio-wild world of latin house music. ñ: I saw you at the Latin Billboard awards the other night. Very cool because you won for best video and your dad won for his record. Jr.: Right. It was great and later we were standing there with Julio and Enrique Iglesias and it was just so cool. ñ: Was it hard growing up with such a famous dad? Jr.: I knew he was well known, but I didn’t realize he was an international superstar… I just thought he was a well known musician around the neighborhood. ñ: You grew up in New York like your dad? Jr.: After I finished school we moved around a lot.. we were the Puerto Rican Jeffersons. Eventually we moved to Manhattan. ñ: When did you move to Miami? Jr.: After I went to Five Towns College. It’s not Julliard but it’s an excellent school to learn about the business. And you know I just wanted to move to Miami… nuestra musica está aquí. (our music is here)… I mean it’s really strong here. We brought the New York thing with us. ñ: Is Latin House the strongest here? Jr.: Well you’d be surprised. I mean in places like Toronto, it’s huge. I had a number one hit in Canada with Oye Como Va… it’s still getting rotation up there. Miami, NY, LA… those are the other hot spots, but there are little pockets everywhere. ñ: How do you think your music fits into the legacy of your dad’s music? Jr.: I try to avoid nepotism… I mean my music is Latin House, dad calls it Rock & Roll… his bag is jazz, Latin Jazz. I try to avoid doing the same thing, and hip hop and house just snuck in on the real. ñ: Latin Hip Hop Influences? Jr.: As far as influences go there’s Arty the one man party, Gino Latino.. in Puerto Rico there’s El General, the Kid Power Posse..but Latin hop hop has the potential to be huge.. Really crossover, Japan, Europe, Africa. There’s also Magic Juan and the Proyecto Uno guys, he’s from Jersey..Los Ilegales, are great with the merengue thing, Marc Anthony… who grew up down the block from me..he’s crossing over nicely, he’s on The Substitute soundtrack now. On the Latin tip, there’s Celia Cruz, the queen. ñ: I saw her play with your dad the other night at Yuca. She really is the most gracious woman in the world. Jr.: She’s a really amazing woman. I love her, she’s my Godmother. ñ: I was talking to your dad about that great picture, with your mom and him running across the Brooklyn Bridge. You know that cover? Jr.: That’s the three of us, I’m in my mom’s belly in that shot. Margarita Puente. Jr.: She’s kept us together. She really looks out for my dad, and has always taken care of me and my sister. She travels everywhere with dad. Like most Latin mothers she’s the center of the family. And sometimes dad acts like a kid too. And I have a brother from another marriage. He’s my brother through and through though. Thanksgiving at our place is amazing. Strictly for the family, very private. Jr.: Soaking up the Miami vibe and creating. There’s a song called Guarachando on the soundtrack from for better or worse, and I’m getting ready to start work on another record. Life is good. Hanging out here with my dad..it’s an honor. ñ: What’s the big lesson he’s taught you? Jr.: Everything is a learning experience… that’s what he’s taught me. Ran Kan Kan, Kan Kan. He more than plays music. He is music. The way he culls inspiration from out of the air. Making up a song in a sec. Goza. Tito. Goza. When Tito Puente put out his boxset encompassing his entire career in ’97, he was readily available for interview and we took full advantage of our opportunity to talk to a legend. At the same time his son Tito Jr.’s Latin Hip Hop thing was taking off and it seemed like a great father’s day feature for us. 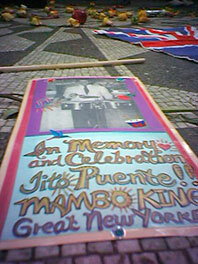 Today Tito Puente Jr. is carrying on in his pop’s footsteps and playing Latin swing/jazz/Ran Kan Kan-Tito Puente music. Goza Tito. Goza. Wandering through NYC this year in a really bad mood ( I had some personal stuff goin’ on), I was headed to the Puerto Rican Day Parade and made my way past the Dakota, always enough to make you feel angry, when you think of Lennon and his murder. I cut through the Strawberry Fields part of Central Park and, not to over romanticize it, it was especially lovely and peaceful that day. The parade felt far away but faintly present, and you could hear the sounds of it in the distance a bit. Someone had placed this lovely picture of Tito on the Imagine circle in honor of the parade. I don’t think either John or Tito would mind sharing their space.